Delicate faceted Ametrine rondelle beads have been wire wrapped using recycled sterling silver to handmade silver rings then fitted to a sterling silver chain.The focal feature is a hill tribe fine silver leaf to complement with a hanging amethyst bead and silver heart. To complete this necklace a silver wire wrapped faceted mystique topaz briolette bead was added. Karen has been designing jewelery for over 12 years and creates original pieces using conflict free precious stones and silversmithing techniques. All jewellery is individually hand crafted, using a variety of materials, sterling silver sheet, recycled silver, wire, copper, pearls, semi precious stones and crystals, making each piece unique. 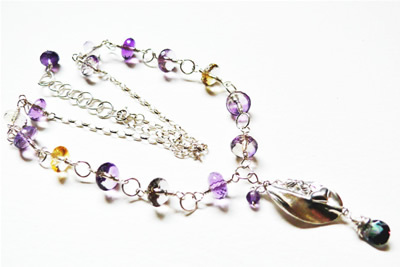 Karen is passionate about her creations and hopes it reflects in her jewellery. She has her own hallmark.